►►French domestic spy chief cleared of snooping charges. Back in October of 2011, intelNews reported that Bernard Squarcini, who then headed France’s domestic intelligence agency, the DCRI, had been charged with spying on a journalist with the daily Le Monde. The accusation was part of a wider case of domestic snooping, in which Squarcini was believed to have been trying to detect the source of government leaks to the press, allegedly on orders by then-President Nicolas Sarkozy. Earlier this month, however, an appeals court in Paris rejected two of three charges against the former DCRI chief. Squarcini could face up to five years in prison if convicted of the remaining charge. ►►FBI documents termed Occupy movement as ‘terrorism’. A number of heavily redacted US government documents, released following a Freedom of Information Act request, reveal that the FBI organized a nationwide law enforcement investigation and monitoring of the Occupy Wall Street movement beginning in August of 2011. In some documents, the FBI refers to the Occupy Wall Street protests as a “criminal activity” and “domestic terrorism”. ►►Wiretapping by Russian spy agencies doubled in five years. Wiretapping by Russia’s intelligence agencies has nearly doubled over the past five years, according to The Moscow Times. In Western countries, intelligence agencies were given wider powers after the 9/11 terrorist attacks. But in Russia, the exponential growth of wiretapping began after 2007, when terrorism by Islamic-inspired separatists was already on the decline. A federal law passed in 2010 expanded the legal grounds for wiretapping Russian citizens. Now, intelligence officers can wiretap someone’s phones or monitor their Internet activity simply because they allegedly received reports that an individual is preparing to commit a crime. ►►Ex-NASA scientist gets 13 years for spying for Israel. Former US government scientist Stewart Nozette was once on the cutting edge of space exploration, but he will spend 13 years in prison for trying to sell some of his country’s most closely guarded secrets. In 2009 Nozette sought to sell classified information to someone he thought was an Israeli Mossad officer but was in fact an FBI agent in an undercover sting operation. 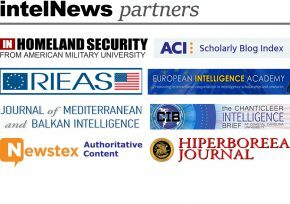 As intelNews explained back in 2010, Nozette was not simply a Mossad agent-wannabe, but had actually passed information to Israel in the past. ►►French intel under fire over Toulouse gunman. The French government went on the defensive last week amid questions over why its intelligence service had failed to deal with Mohammed Merah. The self-confessed al-Qaeda militant died in a police assault on his flat last Thursday, where he was tracked down after murdering seven people, including three children and three soldiers, in a series of attacks. With hindsight, Merah’s past appears to make him an obvious suspect —he had at least 15 criminal convictions, some with violence, had become a radical Islamist and travelled to Pakistan and Afghanistan. One press report said that in 2010 Merah forced a youth to watch videos of al-Qaeda hostage beheadings. When the boy’s mother complained, Merah allegedly attacked her, putting her in hospital for several days. ►►Ex-Mossad chief says Israel will know when Iran begins producing nukes. Former Mossad head Meir Dagan said he believes Israel will be aware when Iran moves to the stage of nuclear weapon production —for example, enriching uranium to a degree of 90 percent. Dagan said that at that stage Israel would have to attack the Iranian nuclear sites if the international community does not stop its program. Dagan said he believed the Israeli Air Force has the capability to significantly damage Iran’s nuclear sites, yet repeated previous warnings that such a strike will have serious repercussions. French spies become embroiled in Renault’s espionage saga (corrected). The Renault spying saga has taken a new turn with the carmaker accusing France’s domestic intelligence agency DGSE DCRI of sabotaging its reputation. Jean Reinhart, Renault’s lawyer, said that the DGSE DCRI had leaked details of the inquiry into accusations of industrial espionage. Palestinian Authority documents leaked by ex-MI6 agent. Chief Palestinian negotiator Saeb Erekat said Wednesday in an interview that a US citizen, who worked in the US State Department, and a British former MI6 official, are responsible for leaking the so-called ‘Palestine papers‘. NY Times editor calls Assange ‘spy-like’. WikiLeaks founder Julian Assange resembles a character from a detective novel and is “elusive, manipulative and volatile”, the executive editor of The New York Times says in an upcoming book. Open Secrets: WikiLeaks, War and American Diplomacy, a digital book featuring an introduction by Times executive editor Bill Keller and contributions from other Times reporters, goes on sale Monday.